I have been in Paris for a review meeting for the VisMaster project. I arrived the afternoon before the meeting started and so unusually had half a day to wander around, mainly to check out the location of the meeting places, but also to see Notre Dame, which was really just outside my hotel window. The hotel “Hotel Les Rives De Notre Dame Paris” was somewhat higher budget than I intended, but there was clearly some big meeting on this week as everything seemed booked solidly for the days I needed. However, given its location and it was a double room, it would be an ideal location for a couple visiting Paris: wonderful views, furnishing that made you believe you were in Paris and breakfast in a cellar that had clearly been there since the days of Victor Hugo. I mention Hugo as one of the highlights of my half-day wander is the Shakespeare and Co bookshop just opposite Notre Dame. 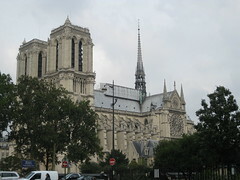 The books are all English but there is a special section of English translations of French authors and here I bought a copy of Hugo’s “Notre Dame de Paris“, the fateful tale of Quasimodo and Esmarelda and inspiration for the “Hunchback of Notre Dame” films. 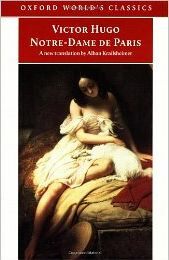 As well as Hugo I also bought a copy of one of Montaigne’s essays, which strangely haven’t yet found their way to Hollywood. Having bought two books to load my already overburdened suitcase destined for its 15 kilo Ryanair weight limit I was drawn back and this time looked through the second hand section. It was fascinating to see what the English speaker in Paris reads, and I was again tempted and came away with Edna O’Brien’s “Mother Ireland” and also an old psychology book “Thinking and Reasoning”. It is an overused title (a bit like “Human Computer Interaction”) and I almost passed it by as it was clearly an old book and so obviously “out dated”. However just in time I noticed the editors, Wason and Johnson-Laird, and realised this was a collection of classic papers from the late 1950s and early 1960s, a real treasure capturing the period when cognitive psychology flowered. However, the high spot for me1 was the first evening when I ate on my own in a small restaurant, next door to the bookshop. In the past I have been critical if not dismissive of French cooking. Not French food — cheese and bread from even the most basic supermarket is an epicurean joy, but the food you get in French restaurants. Now by French restaurant I think I mean self-consciously “French” restaurants and in particular Parisian restaurants, as I have mainly been in Paris and in Toulouse twice. The regional food in Toulouse was wonderful (once you get over the fat), but even there “French” restaurants were a disappointment. It was not that I have only been to the Parisian tourist haunts, where the contempt of the non-Parisian can be apparent and where they serve the kind of lump of meat and pile of potatoes meal that I last saw in the UK thirty years ago, with the sole exception of some highly flavoured sauce instead of the customary British gravy. On many occasions I have been with French and Parisian natives who have selected carefully and taken us to well-classed restaurants, but they have still left me disappointed. In Italian restaurants, even the most basic Formica-tabled trattoria, the food itself is not treated with the reverence of the French, but as a more homely pleasure. Not unlike the everyday Catholicism of Italy compared to the more austere cathederals of France. In Italy, like the restaurants I find today in the UK (not 30 years ago), the appreciation is of the food; the food is the focus; the food is what you eat and what you enjoy. In contrast, in French restaurants it is always the chef that is king, the centre stage, the impresario. That is I would have always said this until now. 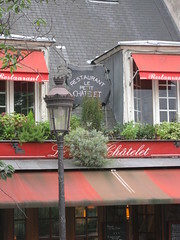 Opposite the Notre Dame, set back from the busy Seine-side, in thoroughfare by small jardin, is “Le Petit Châtelet“. It is crushed on one side beside the brash tourist restaurants that cluster round Notre Dame like flies once did round the fetid sewers of mediaeval city rivers. 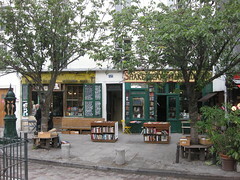 On the other side it flanks Shakespeare and Co., which feels a closer bedfellow. The service was impeccable and friendly and the food divine including sorbet in unexpected flavours such as lavender. Out of the dirty mire that had been my previous experience of Paris, like Notre Dame itself rising from the foetid streets in Hugo’s account of 15th century Paris, Le Petet Châtelot has redeemed French cuisine in my eyes. I’ve been away most of the last two weeks with just a few days at home in between. However, just before I was first away I heard the Scottish Justice Secretary Kenny MacAskill announce the release of al-Megrahi. The decision was clearly hard and arbitrating the balance between justice and compassion is an unenviable task. Whether the final decision was right or wrong, hearing MacAskill’s explanation of his decisions made me proud to be living in Scotland. Rather than bowing to the clear political pressure he was under, instead he kept his focus on what justice means in a land where compassion is at the heart of who we are. In a world often ravaged by war and terror, suffering under human cruelty, and governed by the twins of aggression and revenge, MacAskill put himself under a higher order and demonstrated the clear difference between a country still under the influence of its Christian past and those, from all sides, who besmirch the names of their own countries and religions by terror and violence. Since then the grubby world of UK deals over oil and US deals over billions of dollars of compensation payments have both been aired, but it appears that MacAskill’s decision stood against pressure from all sides. It was perhaps inevitable that the release would provoke some controversy, but disappointing nonetheless; one always hopes that integrity will triumph over knee-jerk reactions. However, it has been especially galling to hear US voices raised in protest, a country which for so many years acted as safe haven for IRA fund raising; bankrolling the London bombings of the 1970s and beyond. While Gaddafi supplied the weapons, the US public supplied the dollars1. I was only young at the time, but these were vicious attacks in crowded tube trains and on the streets of London and elsewhere, designed specifically to cause maximum death and injury; and all the while, in the US, the IRA were allowed to operate freely due to political support in high places. Obama came to power with the promise of a new attitude and a principled approach to politics, so it is doubly disappointing that he has failed this early test of principle over public opinion. If the current White House staff cannot accept the independence of the Scottish justice system over politics, what hope in other parts of the world.